The past few weeks I’ve been trying to understand how the SAML protocol works. I’m planing to write a couple of posts about SAML in the future so first, here is a short introduction in SAML. So basicly its a big XML schema. SAML is built up of four main specifikcations. Assertions, protocols, bindings and profiles. This is the actual information being sent, such as credentials, profile information and authorization decisions. <saml:Issuer> The entity sending the assertion. <saml:AuthnStatement> Authenitcation information, here only authentication method, PasswordProtectedTransport. Aka login was don with username and password. Defines how the messages are transported in a standard communication protocol for example SOAP, ie wrapping an assertion in a SOAP envelope. The profiles define descibes on a higher level how the defferent parts should be used to solve a task. For example the Web browser profile describes how authentications is done from a web browser. 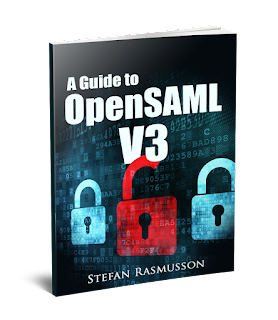 In my book, A Guide to OpenSAML i walk trough in detail how to use OpenSAML to implement SAML.